They should've had some kind of selection process before hand or something, i mean a heap of the people that got stuff from free day would've never purchased from sparkfun before and i think that is kind of stupid. Imagine going out into the mall and tossing $100k in the air, it wouldn't be fair would it? Internet connection really doesn't have much to do with it, besides the speed of your clicking the submit button. It was just whoever was lucky enough to have the server respond to them. But anyways, best marketing strategy ever? This probably cost SF ~$30,000 and they got the number 1 hit on google for several hours, and they are in the top 20 searches 5 times right now. Best 30K ever spent by a marketing department. I know! Sparkfun is completely engraved into my brain now, whereas before I just thought of them as just another electronics store. You can add me to the list of whiners apparently. I was pretty frustrated with the whole experience. I really needed those parts for my project and after all their bragging that the servers were upgraded I was pretty angry after not being able to get in. I'd populated my cart weeks before and was poised with my finger over the button. The current stats are something like this: 1 person out of 70 or so was able to place an order. If I'd known the site would crash minutes before the free day started I'd never have planned on it being able to get some parts. Ultimately I'm more angry that they made me look like a fool for assuming their offer was a realistic one - 1 in 70 combined with crashing servers isn't realistic at all. That's my fault and I won't make that mistake again. As soon as the free day was over and I stopped grumbling about it, I hopped over to Trossen Robotics and snagged every part I needed. I'm sure I'll go back to Sparkfun in the future but I'm pretty irritated right now and I won't be back until I simmer down some. The review of freeday! Your fortune tells of a long forum post ahead! Stats included! "First and foremost, we want to give back. We've had a stellar year in 2009, and it's all because of you. So please, have a beer (or a Stepper Motor Driver) on us." Did we accomplish this? We think so. This was Free Day's primary goal because our customers are the biggest part of what makes SparkFun work. Their innovation and creativity makes this "world" turn. In our opinion, the beauty of DIY electronics is its openness - this type of technology should be available to everyone to play around with. We thought limiting the promotion to just our prior customers would really be going against this notion. So we opened it up - to everyone. This left some people feeling jilted and some people ecstatic - but overall, we think this was a good thing not just for the people who got their order through, but for the whole DIY electronics community. "Second: We wish we could sponsor more groups but we don't have a sound way of selecting appropriate projects. Because we can't afford to say yes to everyone, we have to say no to everyone. It pains us every time we have to do it. So this is a way for us to evenly enable all the students and great minds of the world to pickup a $100 worth of free gear. Go for it!" I think the answer to the first questions answers this as well. We hope we helped a few people accomplish projects they've been dreaming up! "Third: Free Day will possibly create a maelstrom of site traffic, the likes of which our servers have not seen. At the beginning of December, 2009, SparkFun will be graduating out of its high-chair and moving into a server cluster. We are excited to have the breathing room, and Free Day will help us evaluate just how much breathing room we're getting. We'll do everything in our power to keep the site up but please understand that the site may go down." This was, of course, more than just a test for our servers - we could've done that virtually and I think anyone who participated in Free Day knows how this worked. Our server went down three times during this ordeal. Once, it really broke on its own (the day before Free Day). Yikes. The other two times, we took it down on purpose before Free Day started to make upgrades we knew we'd need to have even a fighting chance of completing the day. Did our upgrades work? Yes and no. Yes, we were able to finish Free Day. No, it didn't go as smoothly as we hoped. Our site was slow as molasseses. We learned a ton in the IT realm of things and will use that information down the line. 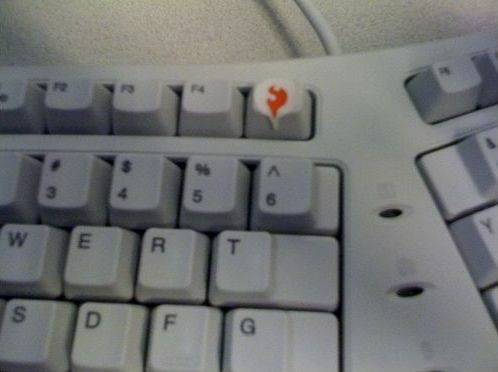 We hope in the meantime your F5 key is still intact and functioning. "Fourth: We turn 7 years old! 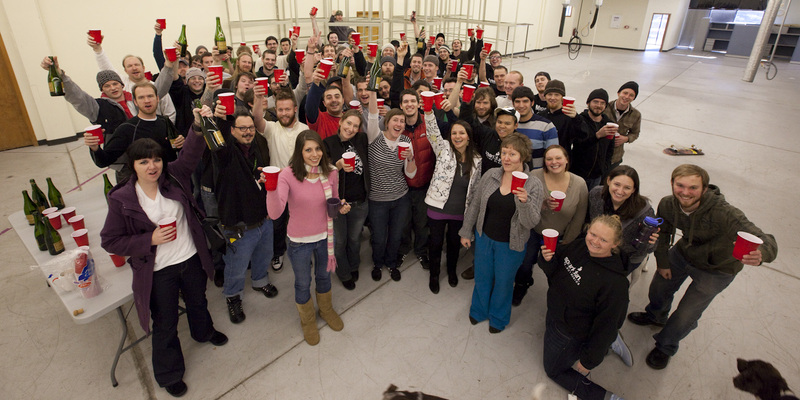 SparkFun is now over 70 employees and is the ripe old age of 49 (in business and dog years). We'd like to celebrate our birthday with a party." Was it fun? Sure! But what we are really looking forward to is what comes down the line a week, a month, a year from now. We hope someone out there got a few things from Free Day and will create something really cool, or just start down the path of DIY electronics and get the same enjoyment we do out of this cool stuff. So now let's look at some graphs and stats! We received over 2,000 guesses as to when Free Day would expire! The winner of $200 was off by three seconds! Guess: 10:44:44. Amazing! On Monday of this week, we were up to 33,000 visit, way above our normal average. Tuesday 41,619 - nearly a record for us (record was Free Day announcement of 46,442). Wednesday (we went down twice that day, once on purpose, once because the database broke) we hit 72,047 visits! That's incredible! We knew Free Day was really going to hurt. On Thursday, Free Day itself, we are still waiting for Google Analytics to catch up but it's obvious we will peak over 111,493 visits today. We took the site down once at 8AM to make some last minute mods, but were able to keep the site from completely breaking down. We were effectively under a self-inflicted denial of service attack but pages loaded, albeit slowly! 111,493 visits! Ow it hurt! We went from 5mbps back in December to 32mbps in January. Necessity is the mother of invention. With load on our servers hitting nearly 10 times anything we've seen before, we learned very quickly how we needed to patch and streamline our site to squeeze every ounce of throughput out of our little e-commerce system. Our site is now running snappier than ever and this is one of the biggest days we've seen in our history. Nice job IT. Every order isn't going to ship on Free Day, or for a few days after. We've got extra tape guns on hand, but please be patient and give us some time to catch up! We will get every order out but it will take at least a week to get back to our normal shipping speed. In the end was it worth it? Completely! Either way you slice it, we got $100 worth of goods into the hands of 1,000 new customers and repeat friends. Did we anger people? For sure, but as lukeweston on twitter so elegantly put it: "This is a bizzare form of nerd torture". We had a blast and hope you enjoyed the excitement and entertainment of the morning. Cheers! [email protected] IRC almost dying! I'll post what i posted on there article, as I do feel betrayed by SF, not by the event itself, but by how they played it off. "I'm sorry, I can't believe you are still claiming first and foremost "you wanted to give back". In order to give 'back' required the person to have given to you first, ie loyal customers only. What you did was 'give away' to anyone and turned what seemed like (and you still believe apparently) a warm sentiment into a cheap lottery joke. Had I know I was facing 1:70 odds i won't not have wasted my time. This is my opinion, and I entitled to have it. Sparkfun has joined the league of evil companies with PR stunts like this." Yes... Now what? When will I be able to get my needed part that costs like $25 and was the first on my list? I can afford to get only that part and I need as soon as possible. But after so many orders to prepare, it will take some weeks until they'll get to mine. I guess I should look at Trossen or other sources, if I'm lucky, perhaps they have it in stock. Well, I guess many people feel the same. I can do what I want to do without that part, but some people can't. I kind of knew it will turn out like this and didn't set my hopes high. I'm only sad for the guys that really needed the parts. And upset on the guys that got their parts and resell them. That is total disrespect. I would not buy a part from such a guy, ever. From all the stats SF gave us, there is something missing: how many people were new customers. I hope their number was worth hurting the loyal ones. So, from now on, I'll talk about this day as "the sparkfun lottery day"... (lower letters intentional). At least I managed to make a few people happy by giving away 6 R-Dev-Ino boards: one guy from LMR forum and Chelmi, Joker94 and Smash from SoR. It's not a big value, but it makes me feel much better, because I know they are going to use them for robotics. If I'm ever in Toronto, you get a beer! I have to wonder (and will never know for sure) if this has done more harm than good. My opinion is that it makes their business look pretty amateur. Maybe that's true to some extent, but the certainly got a lot of publicity out of it. Personally I'm probably going to end up buying some of the items I put in cart, especially since I already had my mind set on getting them. Its all part the advertising. "God chose to make the world according to very beautiful mathematics." Its Hawaii Five-O. Get it? And that is why I've given away the things that I've given away - I hope that they are used and appreciated. CircuitGizmos has shipped "extra" things every once in a while. But it isn't played as a contest when it is an obvious marketing ploy. I certainly wouldn't want to fake doing some "good" and as a result anger a bunch of people. That makes little sense. So question for SoR: How could I give something back to SoR members without it being an ugly marketing ploy? How would I make it fair to say "I want to give away X"? Start a new thread here and have people post to qualify? Is that fair? Unfair? I'm curious how I can generously give something away without it creating any ill will. I'm curious how I can generously give something away without it creating any ill will. I think Admin has the best idea, make a contest for people based on how well you write tutorials. You reward someone deserving and create an awesome collection of tutorials for beginners to use. I've actually given away these: http://www.usbmicro.com/documents/2CDECB6069BC98A8B0B408E789A25B26FDF6DF71.html to people that have provided some application or example ideas. I could offer one as a reward to whoever comes up with the implementable best idea on how to use one. I'd hate to do that if there was little interest. Are people here interested? Also - The devices can be used with Linux, but I have little sample code for that. I'd offer one in exchange for Linux code. I'd use one of those to interface my vintage Model M keyboard to usb. And I think I can probably work up some code for linux too, but I'm not making any promises until I've actually done some research. I'd like to see something like that. PM me when you need more information. $100 in free stuff would have helped out a lot to get my project farther off the ground. Oh well. 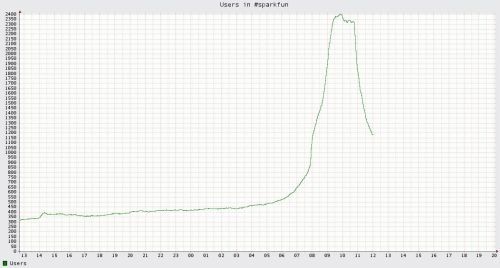 I'm just as happy seeing the statistics for the day though, (for instance: 2400 people in the Sparkfun iRC and Sparkfun was the number one search term on the internet for a while ) It's cool to see the attention "Free Day" drew to hobby-ist electronics in general. That can only be a good thing I think! I recognize the signals of the ancient flame"
True, but for example, free day was posted on SlickDeals, a site with a ton of cheap people. I saw posts saying "I don't know what this stuff is but I guess I'll get something and eBay it afterwards"
they rewin it for all the ameture roboticists that needed it to furthur their robotics and knowlage. Guys! It's not SF's fault if you didn't get your free stuff... They made a very generous gesture today, be grateful. I have to second that notion! I am sure nobody that got their (measley) $100 worth won't complain - Nobody that doesn't win the sweepstakes, some lottery etc. blames it on the company behind the event. Remember they're a business and the bottom line being in the green is their primary goal - They've gotten lots of exposure due to this, so I'm 100% that they will have gained on the stunt. Giving away stuff is better than not giving away stuff, no matter who gets it and who don't. Being sad for not getting some free stuff is OK, but claiming that the company is gonna go broke, is cheating or whatever for that reason is just utterly childish. I wonder if they will ever try something like this again? I also wonder if it will truly be profitable for them in the long run as well. None of this i disagree with, nor is what I am complaining about. I'm ok with what happened today. Sparkfun wanted to test their servers, and they did so by treating us like dogs. They threw a few "free" steaks out and watched us fight over them without regard to who actually got the biggest piece. I am also ok with this, i mean, it worked didn't it? And they got tons of PR! What i am upset about is the fact they still continue to claim "they wanted to give back". This is BS. There are ways to give back without upsetting current and future customer. SFE got there servers Load tested (and some PR) today by dangling a few steaks in front of their customers (like we were dogs) yet are still trying to claim "we did it for you". I find it hard to believe so many don't have a problem with this. This was not "lottery day". I'm sure no one get's mad with the Local lottery every time they don't win after buying tickets. But the lottery never said they wanted to 'give back' to all the ticket buyers. I did - about one hour later from Trossen and saved some money to boot. HAHA, i have already started purchasing parts from other sites tonight. I am no longer loyal to sparkfun as i once was. Doh! I forgot about this! I wanted to buy a GPS . . . oh well . . . I'm a business oriented person, tech-minded, and forward thinking. Personally, I think the SF free day was a historical marketing experiment. As someone mentioned before, SF spent only $30k, and got *huge* viral publicity for it. Think about this - a single marketing employee costs ~$50k/year. An instant $20k savings there alone! Not only that, it encouraged nearly everyone to search through the SF product line, so everyone is now aware of what they offer. This represents huge profit gains for SF, and $100 saved by 1000 lucky customers. SF published server stats, but I promise you they won't publish the large profit gain they'll see in the next 3 months! Giving stuff away for free, for a profit, to me is the future. SF was the first to do it on a very large scale. I've been doing this for years with SoR. Others will follow. I didn't get anything of course. And I'm fine with that. It was blatantly obvious that competition was going to be much higher than the 1000 people that would have gotten stuff if everyone went for $100 of stuff. I tried, and like most, my luck is only average. All of those whining about fairness are demonstrating a profound amount of me-me-me entitlement. I didnt even try, because I realised that there was little chance in getting anything. I order from sparkfun because I like the products they sell, the shipping is fair and living in the UK, I usually get my orders within 7 days which is good. But most people here seem to think that they were entitled to something free.... You cant even give stuff away without people complaining these days. I especially like the person above who actually spent Â£20 to try and get something for free. IRONY! "Well, kid, there's a word for that, and it's called "apathy". You will find there are ways to deal with problems, other than turning a blind eye and allowing any sort of treachery to become the norm. Deceitful advertising is most worthy of subpoena, without a doubt. One of the first things a child should learn is not to believe everything they're told. An entire generation learned that very quickly through the infamously disappointing "sea monkeys". Nevertheless, tuning it out, considering it "OK" that advertisers are free to lie and benefit so greatly from it, is one of the things truly wrong with people today. I'm new here, and I didn't win at free day. In fact, the site never loaded during free day, not once. I came across Sparkfun by chance, looking for the cheapest deals on a particular product, and the first thing I saw was the advertisement for free day. Saying that, regardless of whether I won or not, this sale was supposedly aimed at "giving back", which is quite different from "giving away". "Giving back" would mean "free day" only for those who have given to Sparkfun in the first place, preferably prior to the initial announcement of the sale. Not random people who just showed up, like me, or people who got told about this sale, especially those only interested in turning something, anything free, into profit. To continue to defend that they were "giving back" is sickening, and maybe my stance would be a little more biased if I had won, but my point is true enough. Some of you are so faithful, and turn the other cheek that your precious Sparkfun had a giveaway, presumably to bring in new blood (let's see how that goes with the eBay crowd), while increasing their reputation with their loyal customers, who they've now earned even more points with, though they were "given back to" no more, and probably even less due to the ratio of Sparkfun regulars to random contest-seekers who showed up for free stuff. An apology from Sparkfun, a blacklisting of the site, pretty much any behavior is far more understandable than this disgusting 'shugging it off and saying "it's ok"' mentality so many people seem to display these days. Sparkfun could've given away $1,000,000 in cold-hard cash to 50 people on the condition that those people have never spend a dime here before. It'd be controversial, but it's their right. As long as they don't blatantly lie about it and say they're giving that money for 50 regular customers when the adverse is true. They said they were giving back. I, as well as many others, have pointed out that while they did give back some percentage (and to those who keep saying "you never gave to Sparkfun, you bought from them", who exactly would they be "giving back" to, pray tell? I'm so very tired of word games like this, and the wording in the case of free day is very obvious and needn't be misconstrued. ), I'm sure a significant part of that percentage "gave back" to people who never "gave", had never spent a cent on this site before, and probably won't be returning unless such an opportunity for indiscriminate profit shows up again. I too doubt their integrity, madsci1016. For this reason, and the fact that after a huge surge of orders, I would likely find myself waiting longer than expected at the usual price, I decided to take my business elsewhere. However, upon seeing all the "I won nothing but Sparkfun is great for giving back to us" sheep, I couldn't help but put my word in, as well as I know these sort of arguments are as purposeful as the worst of humanities blights. Unlike Gsm Man, I've yet, even in these years, taken the downhill route of apathy as the wisest path, and neither, I believe, should so many others, for we accomplish nothing good this way." There are people that are whiners, and there are SparkFun apologists. It was SparkFun's risk to take. I'm sure they hope that this ploy that uses their community as free ad men to get on Google page 1 will result in more customers. When you start making big money like they are you stop caring if you p!ss off a lot of customers, as long as you get the chance to take money from many more. This is a win if they got 5000 new customers for the 2000 that they stopped caring about. Net gain of 3000 people that they will get money from.